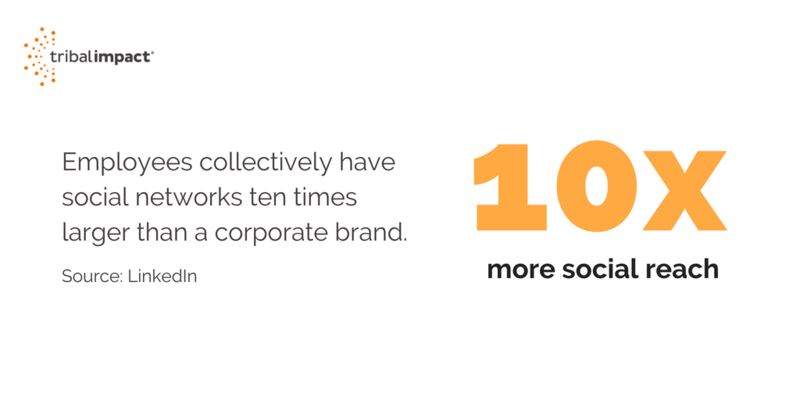 Employee shares also have a better reach than content shared by the company social media channels alone: employees collectively have 10x more connections than a corporate brand (LinkedIn). A deciding factor in having a successful Employee Advocacy program is the quality and accessibility of content available to your employees. We know, from general social media user behaviours, that people generally like to share content that’s entertaining, interesting/factual or that makes them look knowledgeable. If you transfer this mini-checklist across to corporate content, it’s easy to see that some thought is needed to ensure your employee advocacy tool gets used – and, most importantly, gets used repeatedly because it generates the appetite to return. By curating third party news, especially from well-known media channels, that relates to your industry, you provide a link between the advocacy and the social selling elements of the business. Your advocates are then easily on the road to being seen as experts in their field and can use this type of content to commentary blogs and give their opinions and thoughts on new developments or trending topics. Following on from point one, giving your employees the chance to create their own unique content will mean your advocacy channel is more credible due to its varied content feed. It’s far better to have a selection of opinions, guided by chosen topics than something that looks distinctly like robots all posting the same articles. Apart from facilitating social selling, Employee Advocacy also has a massive impact on recruitment and retention within an organisation. Nowadays, people want to know that they are going to be working for a company with the right ethical approach, with values that match their own and one that walks the walk when it comes to valuing its people. There’s no better way to showcase this than to share some of the behind-the-scenes stuff in your advocacy tool. It’s the human side of your business and, these days, we can be open about flexibility, work/life balance and what makes us tick. One of the trickiest challenges with content is simply finding enough. If you’re running low on news and ideas, you will damage the credibility of your Employee Advocacy Program and your people won’t take the time to log in and look for content to share. It’s therefore a good idea to understand which of your partner businesses or which members of your extended supply chain might be championing similar initiatives, running similar projects or achieving results which improve your own ability to add value to customers. Your employees want to build a credible online presence and, to do so, they need to have a deep understanding of who the organisation is, what it stands for and how it intends to position itself in the market. There’s a tightrope to walk here though. The content needs to genuinely add value to the way your people talk about your brand. It can’t be spin though, or even too marketing-focused. This content is about educating people in why their brand is best but without overtly selling. By getting this narrative right, you will benefit in two main ways: your brand story will get a better profile and you will also reduce the risk of people misinterpreting what the brand is trying to do. 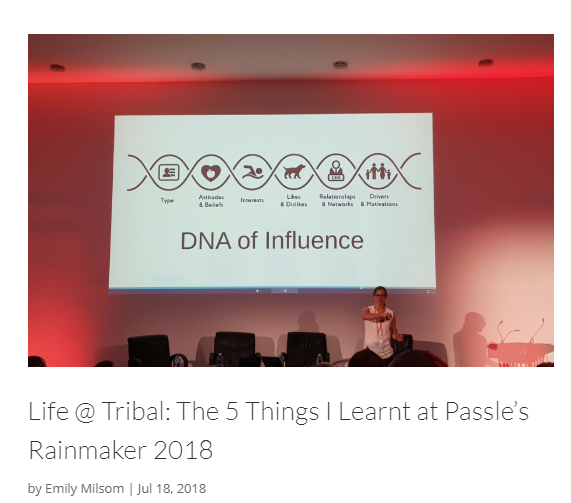 For example, see an image of Life @ Tribal post on 'The 5 Things I Learnt at Passle's Rainmaker 2018'. This category will undoubtedly appeal to your sales, and customer support teams. It’s essential to their drive to build relationships based on knowledge and experience to be able to speak about the latest innovations and updates. Surprised to see this? Well, you wouldn’t think anyone would want to share them but, according to Altimeter research, it’s one of the top types of content that people want to share. It’s also a great way to increase referral hires, which lead to greater job satisfaction and a longer term of employment. Employees want to inspire their network and, as we heard earlier, everyone likes to share something that makes them look good. So don’t be shy about sharing the good news stories: successes, contract wins, new customers are all worthy of your advocacy channel. And sharing a bit about the leadership culture in the business and how you’ve achieved your successes, backs this up nicely. You might feature people who have worked their way up through the business to send a message that working for this organisation is great from a personal development perspective too. Almost every organisation has an official blog channel these days. Why not use it to add content with a more personal slant? By encouraging your employees to write guest blogs, you can showcase authentic voices and opinions from within the company and help your employees to increase the standing of their own professional profile. Finally, don’t forget to include some of the stuff that keeps your people coming to work every day. We’re all human; having fun and enjoying what we do is a massive bonus for employees so, if you’re lucky enough to have a fun and friendly culture, share it. It could be anything from the office party to behind the scenes at an event or exhibition – whatever shows your human side. Whatever content you choose, the main thing is to have plenty of choice, ensure it is fresh and up-to-date and make sure you curate content based on the motivations of your employees, rather than trying to match topics to people’s job roles. Employee Advocacy needs to be easy for people and giving them content which is genuinely interesting and which they have a choice about posting, is the quickest way to achieve this.